My Mum hated the phrase ‘Mother’s Day’, she said it was American and it should be ‘Mothering Sunday’. Every Mother’s Day it was my challenge to find the only card that existed with Happy Mothering Sunday on the card instead. My Mum was a stickler for so many things, manners, grammar, speech. She drove me mad but I miss her terribly and find myself quoting lots of things she said that I used to scoff at. She left this world 6 years ago. Of course today is the day where Mums should get breakfast in bed and cards and flowers. 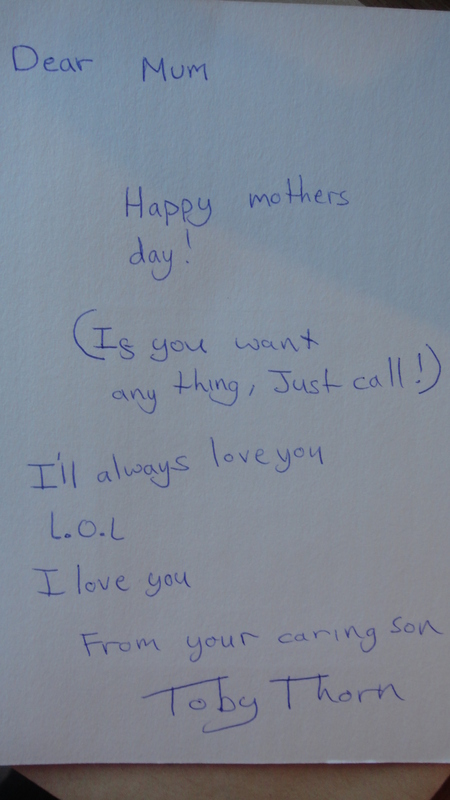 I didn’t always get a card when Toby was alive but when I did get one it was full of love and thanks from my beautiful son. This weekend I went through all my boxes and dug out every card I could find, including ones he made at primary school when he could barely write his name. Each one a special memory with so much more meaning now and so precious. 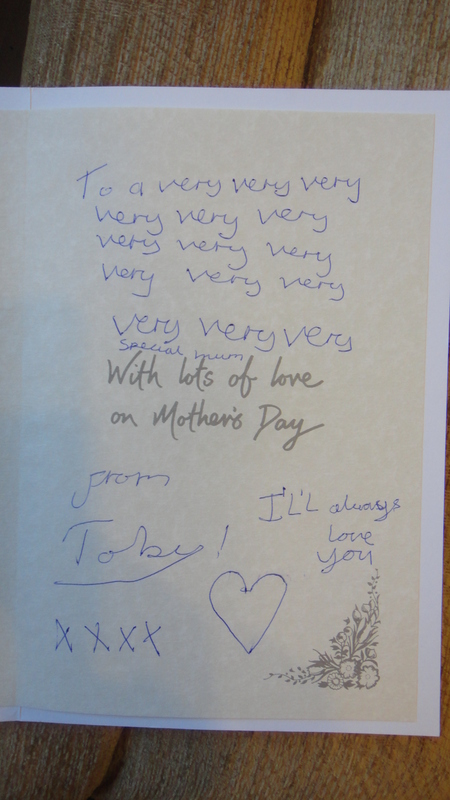 I am still a Mum and every year I will celebrate Mothering Sunday by looking at the sweet cards my son sent me. I am quite surprised that not one of my close friends has called me today to offer some comforting words. I am also suprised that people that haven’t known me very long have contacted me, and they have taken the time to reach out to me. It means so much they will never know how much. Everything gets reframed when you lose a child. Every memory is like precious gold dust, every scrap of paper that your child wrote on, every photo, every school report, every possession takes on a new meaning. I have found that recently I am connecting with Toby on a different level, every day I include him in my thoughts and my conversations. When I am at home I talk to him all the time. I walked on the beach yesterday and drew his name in the sand, all the time I imagine him being there with me and seeing what I am doing and knowing that I will always keep his memory close.